Find out what tradeshows, events and seminars RML Marketing & Business Development Solutions will be hosting and attending. Also details of upcoming webinars and training sessions will be listed here. 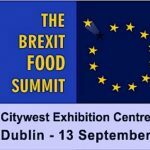 RML Marketing & Business Development Solutions will be attending the Brexit Food Summit in Citywest, Dublin. Email info@rml-marketing.com or contact us through our website if you would like to arrange a meeting. Email info@rml-marketing.com or contact us through our website if you would like to arrange a meeting.